Do you even know why people say you need to "balance your chakras? If not, you'll be sure to enjoy this guest post by Candace L. Talmadge. The word "chakra" is Sanskrit for "wheel." In the context of energy-healing, the seven charkas are simply larger versions of the thousands of intersections between the four parts of self-awareness, or consciousness. Consciousness is an energy field that surrounds and penetrates the physical body that we see with our physical eyes. Like all energy, consciousness vibrates. We perceive that energy field, also known as the aura, with our four non-physical senses. We see it with soul vision, or clairvoyance; feel it with soul feeling (clairsentience); understand it with soul understanding, or clairaudience; or simply know that it is there via soul awareness, which often is lumped in with clairsentience but is its own distinct energy-information channel. The four parts of our self-awareness are the physical body (cellular mind), mental body (conscious mind), emotional body (subconscious mind), and the spiritual body (unconscious mind). 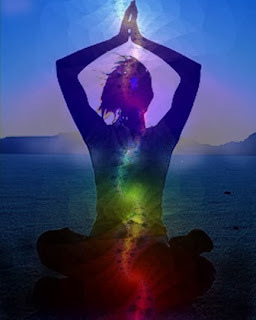 Although not yet recognized by western medical science, the chakras are the true mind-body-spirit-heart connections, not the brain or nervous system. Most chakras are about the size of pinheads. Due to their larger size, the major chakras are useful for retrieving memories that are in the deeper areas of consciousness. Eastern traditions teach that a special kind of energy (kundalini) is stored in the root chakra, which covers the area between the legs. The kundalini experience happens when this energy is released and moves through the other chakras. This understanding may not be entirely complete. Chi-love-divine (pick a favorite label) energy enters the human aura through the crown chakra (the top/back part of the head), flows down the back, loops up through the root and other six chakras, and leaves via the brow chakra. The reason so much of the energy is trapped in the root chakra has to do with self-judgment. Unlike all energy, which vibrates, self-judgment does not. Non-vibrating self-judgment becomes stuck in the magnetic portions of the energy field (the emotional body and physical body to a lesser extent), and gums up the flow of chi-love-divine energy. The kundalini experience can be so devastating precisely because the chi-love-divine energy is crashing against self-judgments on its way through the chakras. Think of how violent a torrent of water becomes when it rushes over boulders and carries huge debris with it. It's very easy to unearth memories isolated from our waking awareness by self-judgment and denial. Just start digging into one or more of the major chakras. But it's not so well known what to do when one or more of these memories is brought back to conscious awareness. The issues can be resolved, but that means finding and releasing the associated self-judgment, and that takes courage and determination not to allow fear to get in the way. Most people have no idea why chakras need balancing in the first place, but it has to do with lifetime upon lifetime of accumulated self-judgments. Only when we start releasing those self-judgments (primarily from the magnetic emotional body) can we begin to heal fully and reach resolution, allowing the pain to go and the power or influence over our thoughts, feelings, actions, and beliefs, to subside. In other words, we are free, or at least freer, than we were. 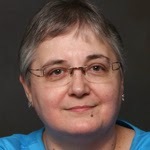 Candace L. Talmadge is an inner shift specialist and author. For a free-ebook that covers this topic in more depth, visit www.greenstoneofhealing.com and sign up for the occasional newsletter. Your article is really good. Hope you will share such more blog in future.